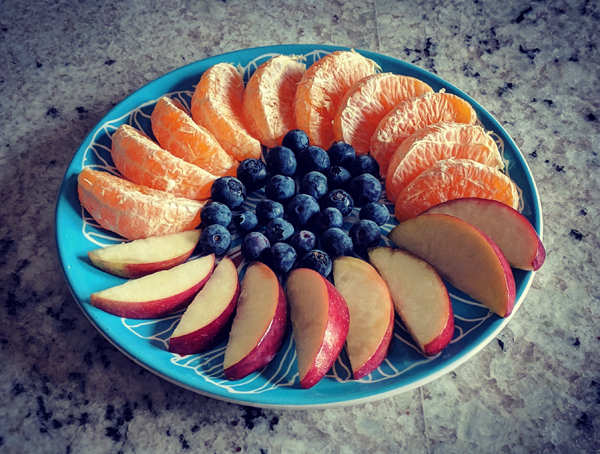 I haven't made anything recipe- or photo-worthy the past week, so here is a picture of a fruit plate I made last night for an evening snack — blueberries and half an apple for me; an orange for Iain. I take my composition of snack plates very seriously. I really do love making up a visually interesting snack plate or hors d'oeuvres tray, even if it's only for myself. It just feels a little bit special when the food is arranged with purpose — and I'll take (and give) all the special I can get (and offer) these days.